Each year, I set out to make several pay it forward gifts. I usually post on Facebook looking for volunteers that want to receive something from me. This year, I did it slightly different than in years past. This year, I asked for my friends to nominate other people to receive a gift! One such nomination was for a friend of a friend that is an optometrist. 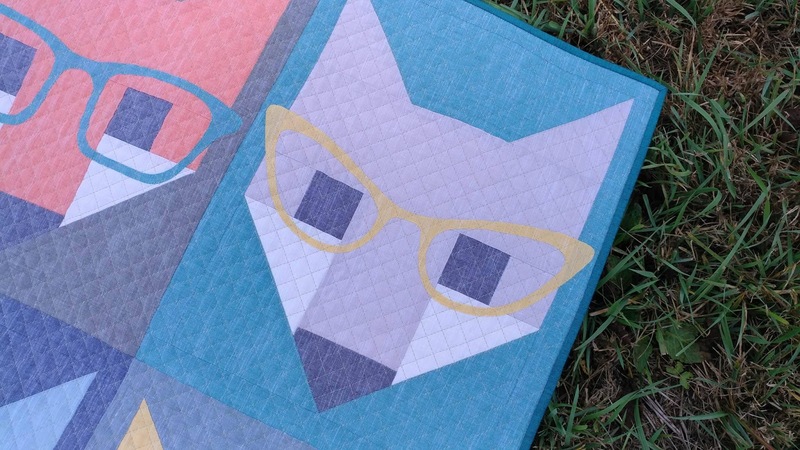 I immediately knew I wanted to make a Fancy Fox quilt! 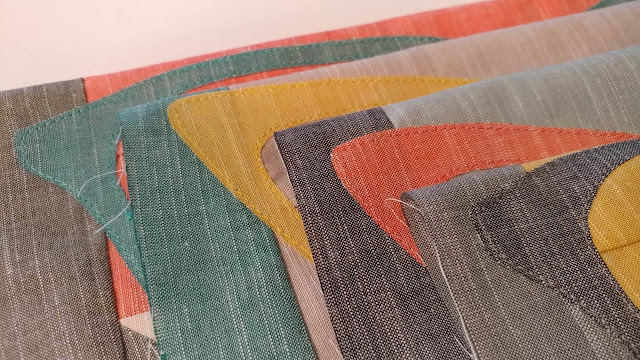 When the fat quarter bundle of yarn-dyed organic cotton chambray fabrics by Birch Fabrics arrived, I knew it was just the perfect fabric for the pattern! The fabrics are woven and have a visual grain to them. I wanted for all the grain to go the same direction in all the blocks, so this meant I would have to really pay attention when cutting the pieces. Each fat quarter measured slightly different than a regular fat quarter. 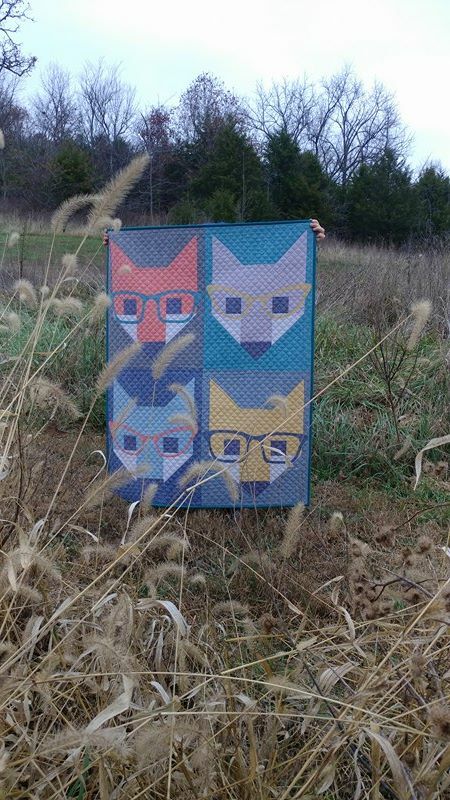 They were closer to 19" square. This really affected the pieces since I wanted the grain to all be vertical. 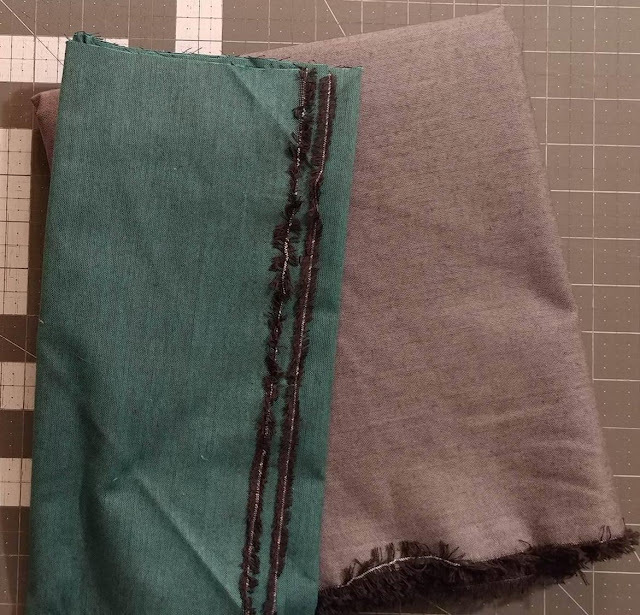 I ended up having to change the outside border width from the pattern in order to have enough fabric. The fabrics are much thinner and softer than typical quilting cottons. 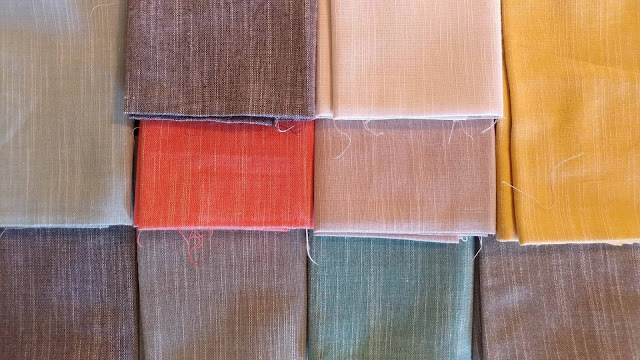 Since the fabrics are woven, they frayed more than typical fabrics too. 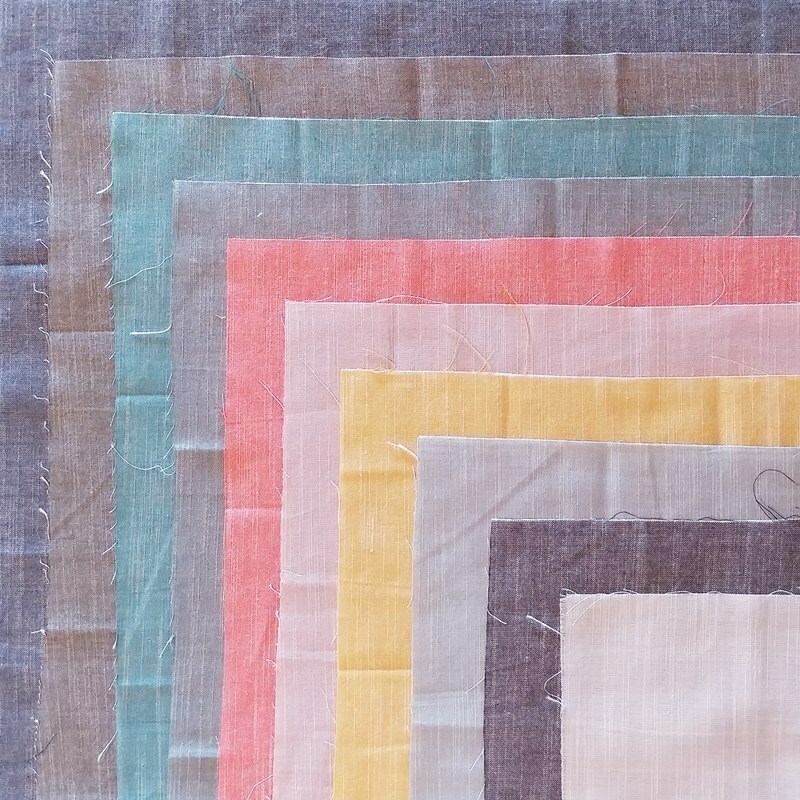 I decided to use a slightly smaller than normal stitch length when piecing to help prevent the seams from coming apart. I love the softness and subtleness of the colors! I pin basted the charcoal peppered cotton, 80/20 batting by The Warm Co., and the quilt top on my dining room table. 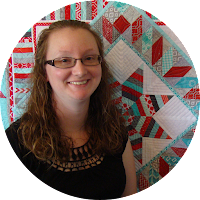 I used my Hera marker to mark an initial 45 degree line across the quilt. Using a larger stitch length than I do for piecing, I quilted straight lines on the diagonal just over 1/2" apart. I used Aurifil 50wt #2324 Stone for the quilting. 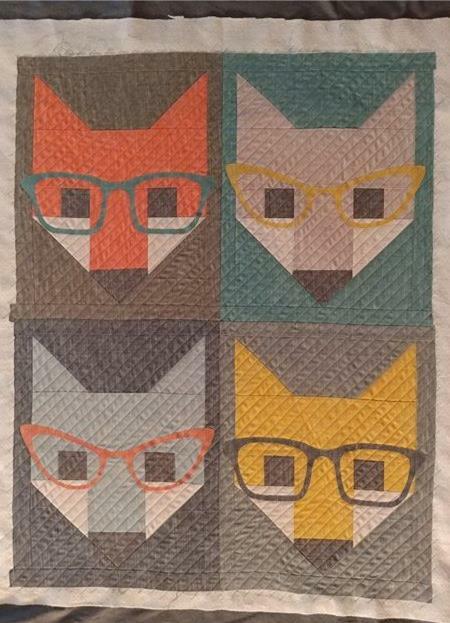 It's the neutral that I also used for piecing the foxes. I have an entire cone of it! 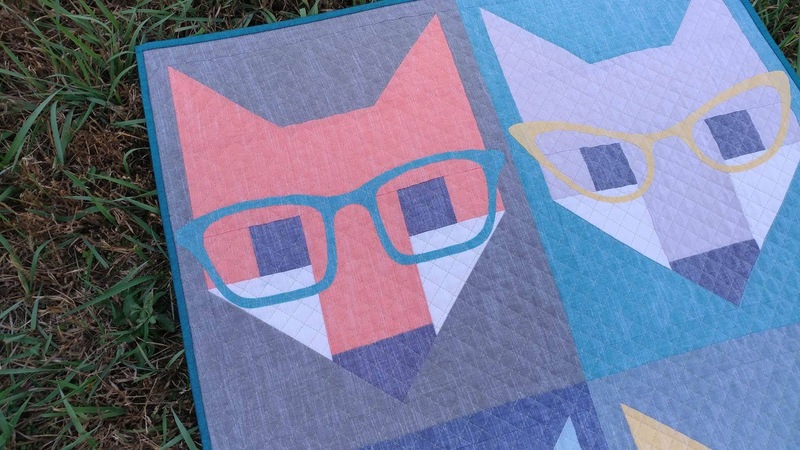 It turned out to be the perfect color for the quilting! 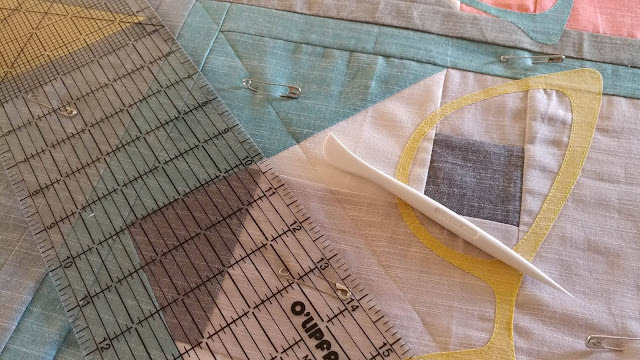 After finishing the diagonal straight line quilting, I hemmed and hawed over whether or not to add straight lines in the other diagonal direction to create a cross hatch design. I mean, adding them would double my quilting time! I just couldn't shake the idea of it, so I started in. I knew immediately it was the right decision! The texture was so great! 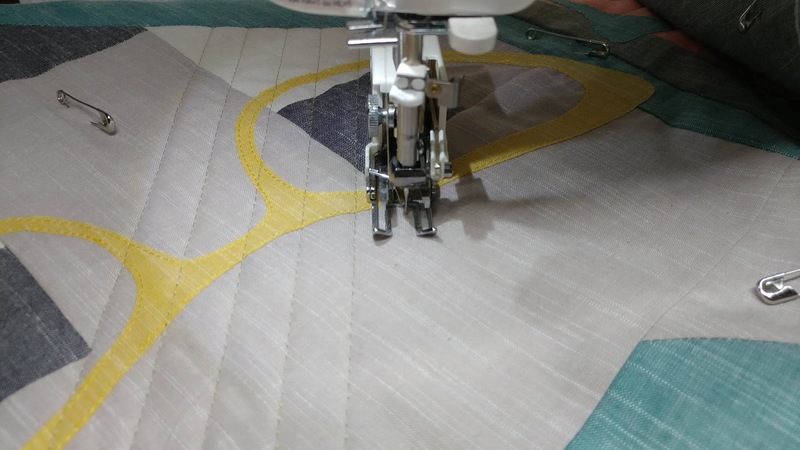 And with my Janome walking foot on my Juki TL-2010Q, I was able to quilt the lines on rabbit speed, so it only added about 20 minutes! I decided to try cutting my strips for binding 2 1/4" wide again instead of my usual 2 1/2". It worked really well! I just might start using 2 1/4" every time now. There is much less wiggle room for errors, but it seems I have improved my method enough that it works! I'm so excited to mail this to the unsuspecting recipient! I'll add a label and ship it off this week! Linking up with Main Crush Monday at Cooking Up Quilts, Monday Making at Love Laugh Quilt, Linky Tuesday at Freemotion by the River, Let's Bee Social at Sew Fresh Quilts, Wednesday Wait Loss at The Inquiring Quilter, Midweek Makers at Quilt Fabrication, Needle and Thread Thursday at My Quilt Infatuation, Finished or Not Friday at Busy Hands Quilts, Finish It Up Friday at Crazy Mom Quilts, Can I Get a Whoop Whoop at Confessions of a Fabric Addict, and TGIFF at Celtic Thistle Stitches. 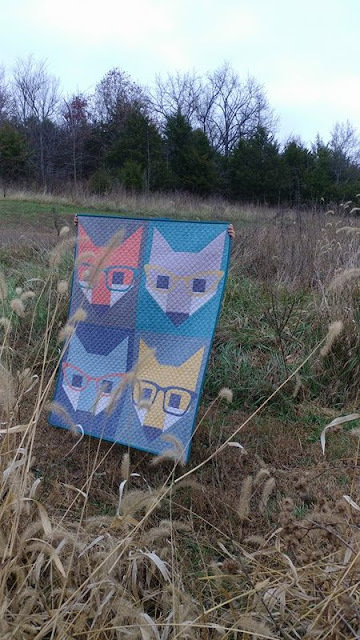 Those foxes are too cute! The cross-hatching job is lovely. What a great surprise gift for someone! You are so sweet to give this cutie away! This post was great reading! 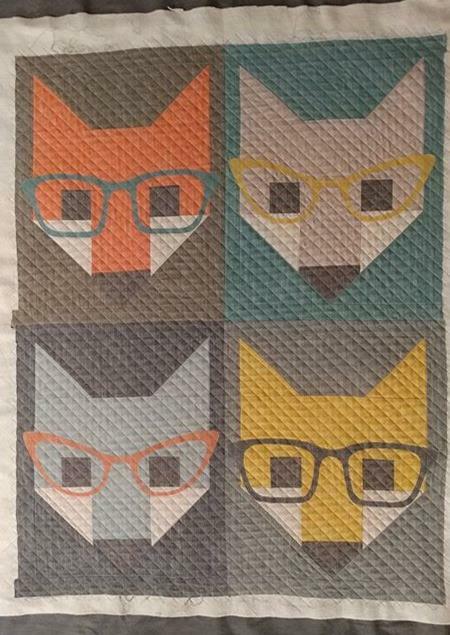 I love your foxes. It's a time intensive pattern but so darn cute. 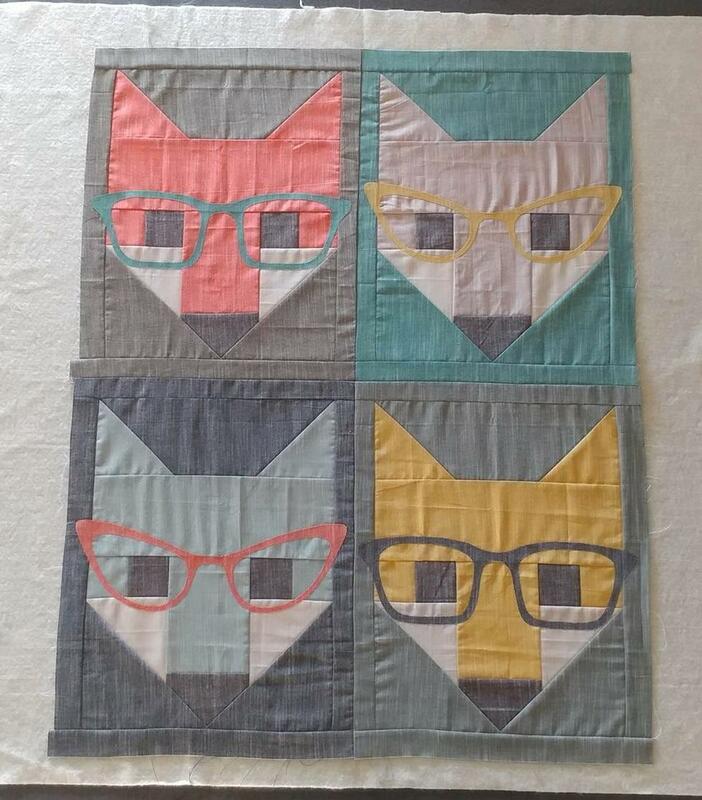 I used the fox pattern for a baby quilt for my grandson. The cross hatching looks great. Love the faded colours of it. Nicely done! Congratulations on the win of the fabric bundle. Paying it forward to a deserving person is really great. Love the quilting. 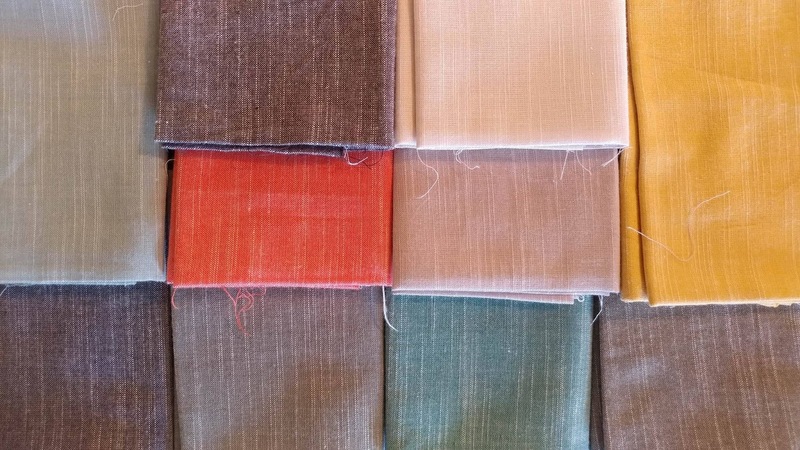 I find that most of the Aurafil thread blends well with many different colors. 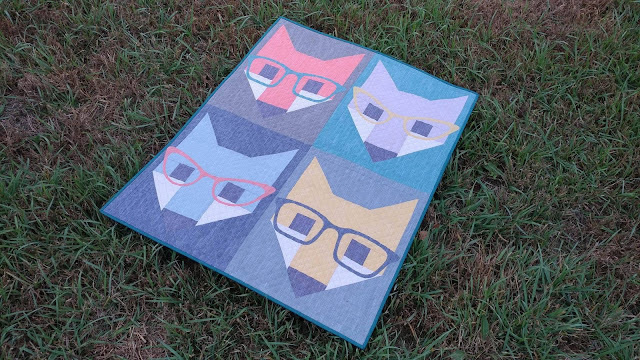 This is a really fun quilt, especially for an optometrist's office! I like the muted colors too. I usually use a 2 1/4" binding now too. It just seems easier to use. I have used 2" on some smaller projects, but only on those that have a fairly thin batting. 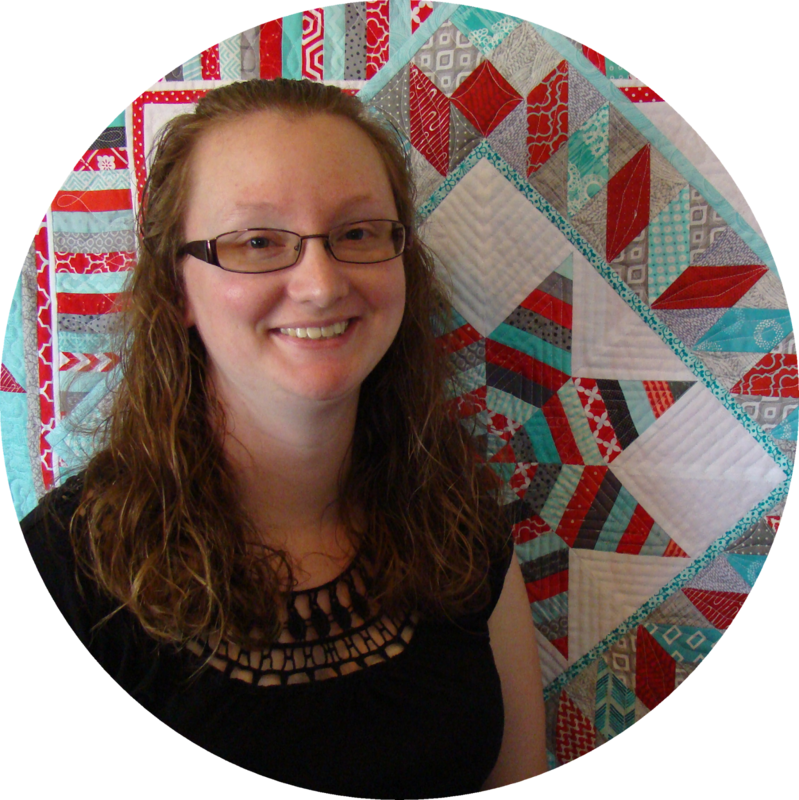 Crosshatch quilting was totally work it! Great job! Such a beautiful quilt! 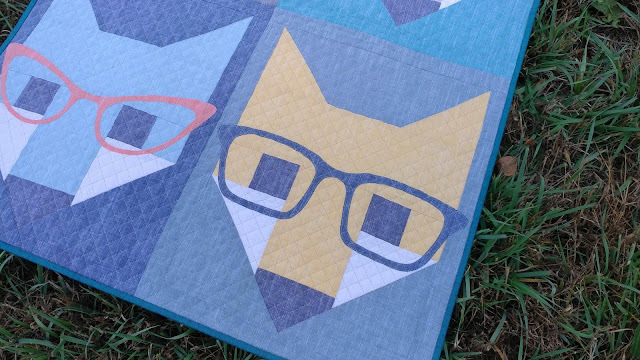 I've been wanting to make a fox quilt. Yours is awesome! Awesome binding also! Enjoy your day!! 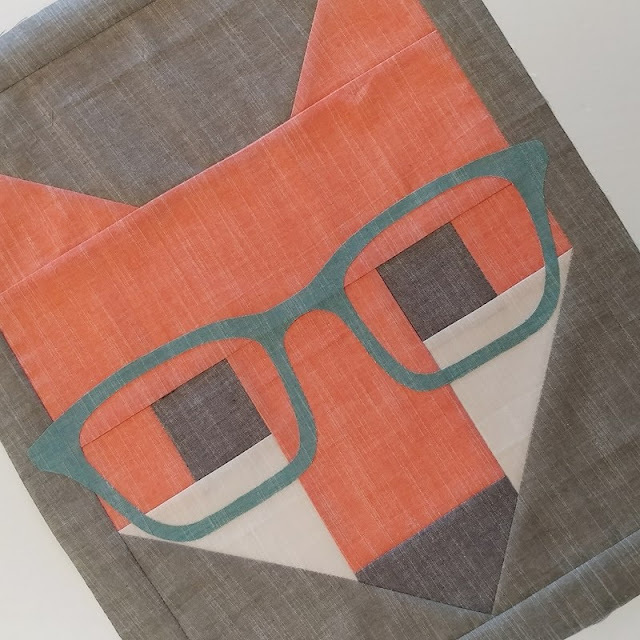 Love your quilt holder! And of course the quilt--perfect in those fabrics. So nice of you to send it off with a wish and a prayer. Beautiful! You have way more patience than I do to match up grain lines, but it does look really great. I have been sing 2 1/4 inch binding for years and prefer it. Fabulous finish! Perfect use of that fabric. So simple but so good. So cute with the glasses! I made a lap quilt of the Fancy Foxes For my grandson a few years ago before the glasses were Available and before my grandson wore glasses himself, or I would have made at least one with glasses. Someone's going to be receiving some very happy mail! Great job Laura! 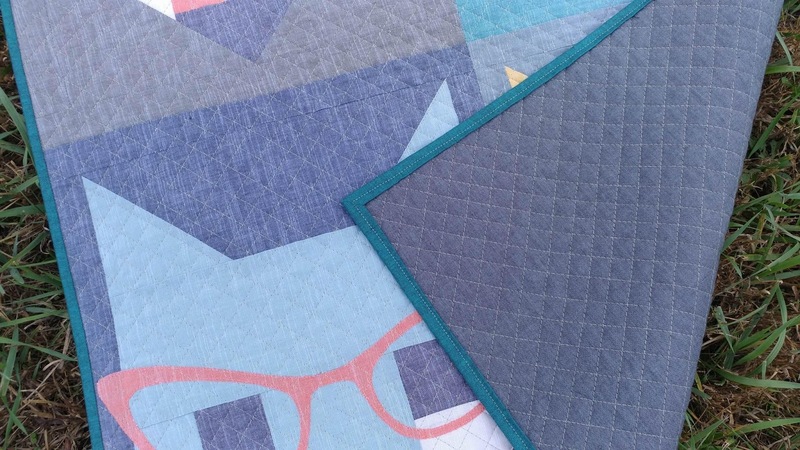 The crosshatch is the perfect quilting design. 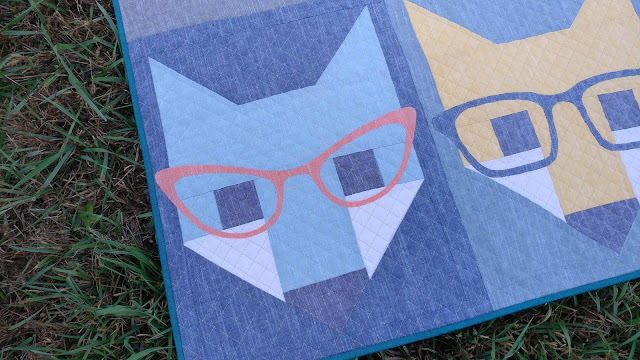 The whole thing is so fresh, modern, and too darn cute! This is amazing! I love the idea that it's going to an optometrist. 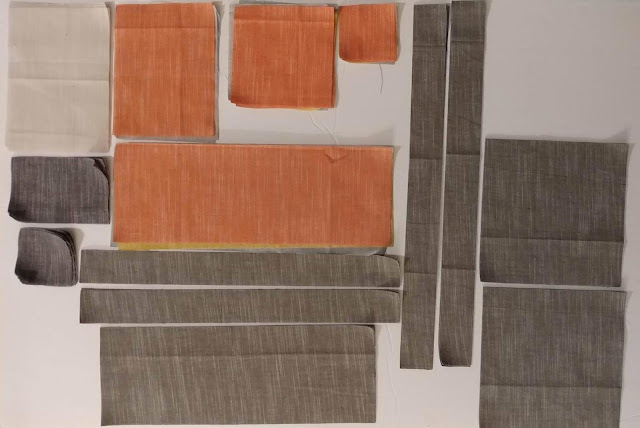 The fabric is absolutely gorgeous, and the extra effort you put in to keep the grain going one direction really makes a difference. You make the best stuff! Your quilt is wonderful. How perfect that everything lined up at the right time with winning the fabric and having the shop hop. This is a gorgeous gift. And well done to your 4 1/2 yo for holding the quilt so well. Perfect - especially with the addition of the glasses for the optometrist! 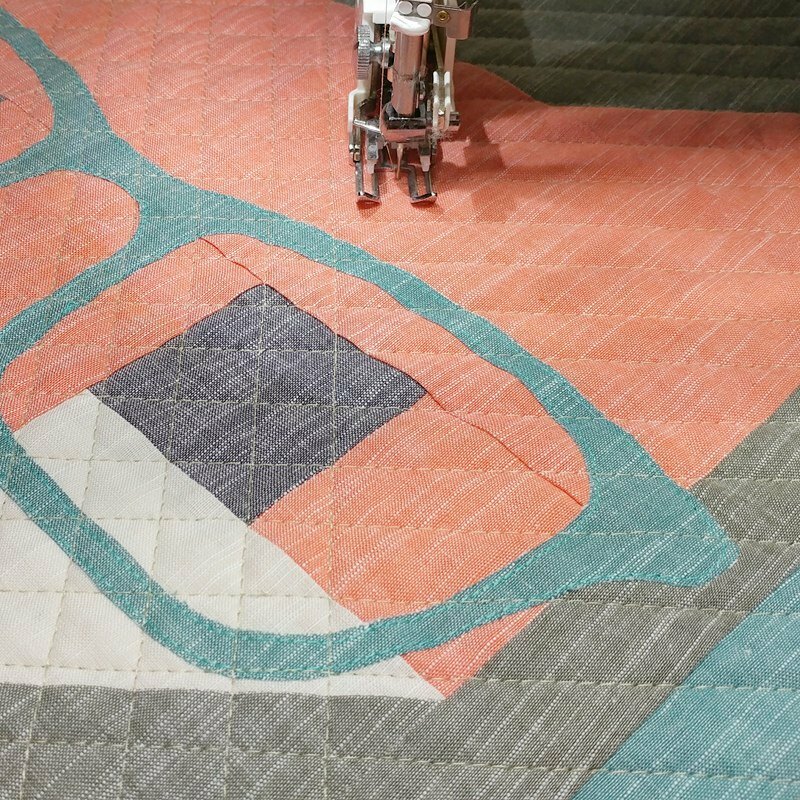 Could not have found a more perfect quilt for an optometrist! Great work. Love the cross hatch quilting! Did you use the Hera to mark each line? Or is there some secret to measuring 1/2" intervals? I'd love to know. Thanks for linking up to Wednesday Wait Loss. It turned out great! I just love those patterns. What a perfect combination of fabrics, piecing & quilting -- beautiful job! Luckiest optometrist ever! This is simply stunning. It has given me an idea for my daughter's birthday .